Sold as Pair with Large Flat Washers and Sticker. TallChubbys offer the highest stability of all the shapes discussed here and work best in a truck that has a stepped bushing seat to take advantage of the secondary step in the bushing, the vertical side wall and the large backside of the TallChubby. They still turn very well and can be used in a softer duro if you are looking for a stable yet plush and comfortable setup. 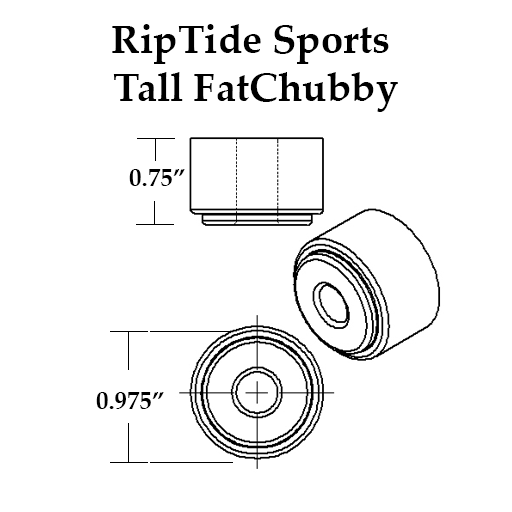 The TallChubby is one of our most versatile bushings because of its size, shape and wide variety of applications. The TallBarrel / TallChubby is our go-to set up for most applications due to its versatility. It is excellent for Freeride, Fast Freeride, Technical Downhill, Downhill and just flat out speed. Harder KranK durometer bushings (96a & 93a) are for heavier-weight riders (over 150lbs) as harder durometer bushings allow for a nice tight set-up. Medium KranK durometer bushings (90a & 87a) are best for medium-weight riders (125lbs & over) as well as for those looking for a looser setup in the RoadSide position when coupled with a harder duro bushing. Softer KranK durometer bushings (84a) are best for lightweight riders (under 125lbs). Super fun for those looking for a really loose setup.